Shopping for your baby can be tricky, and one of the worst areas is shoes. When looking for baby shoes, there are a lot of factors you need to consider. Baby shoes need to be soft and flexible, in order to keep your child comfortable, as well as offering some support to the toddlers’ growing feet. Alongside the safety and support factors, you want your baby’s shoes to be cute. One of the greatest delights of shopping for a baby is exploring cute designs, soft materials, and unique styles. This is perhaps one of the only times in your child’s life that you can control what they wear and you want to make the most of it. You don’t want to have to compromise on safety for style or vice versa. View the Best Baby Shoes, Below. How Comfortable the Shoes Are? How much Traction do they offer? How to make Baby Shoes? How to Size Baby Shoes? When to Buy Baby Shoes? We have handpicked ten of the best baby shoes that will keep up with every stage of your little one’s life. These adorable fleece booties are designed for baby feet. They are made to keep little feet warm and cozy as well as being very easy to keep on. Even if your child is very active and has learned where their feet are, they will not be able to pull these booties off easily. They have a two-snap secure fit, that helps keep the shoe on, as well as an ultra-soft lining that is super comfortable. The two snap closures help these boots fit your child's feet and will mold to their movement. This makes them incredibly comfortable and easy to wear. These boots are available in a great range of bold colors to suit any baby and are the perfect winter shoe. If you want to keep your little one safe and comfortable while still remaining stylish, then you want to check out Zutano. Zutano is a family business that has a simple philosophy – high-quality clothing for your baby. These adorable booties are designed to keep little feet warm and secure, while still remaining stylish. These sweet sneakers are incredibly soft and flexible, which makes them ideal for growing feet. They are made from a breathable canvas that is lightweight so it can support natural foot movement. At such a young age, babies get incredibly excited about their abilities and these shoes will help them develop movement in their feet while still being secure. There is a great range of colors and styles available to suit any baby. The adorable design, including lace features, would be a brilliant gift for new parents. The anti-slip sole of this sneaker is made from soft rubber that has great wear. It is enough to support little ones who are slowly learning to crawl or walk. As a non-slip rubber, you rest assured that your baby is safe and will not slip on any surface around the home. The slight padding in the insole is very comfortable and supportive. These sneakers have an adorable design and are very supportive of growing feet and developing babies. Adidas is one of the leading brands in sportswear and sneakers. They produce high-quality, genuine leather sneakers for a wide range of feet including babies. You can start your child’s style journey early with these chic sneakers. Choose from black, gold or rose gold stripes to make the most out of your little one’s outfits. These sneakers have a rubber sole that is durable and secure. It has a gripped base that will keep your baby upright and sturdy on any surface. If your child has just started to crawl and is making their shaky progress into a walk, then these sneakers are an essential purchase. The interior is made from a soft textile which is incredibly comfortable and allows movement in their feet. This high quality is continued with the suede upper that delivers a plush appearance. The Velcro straps are very easy to put on, meaning you don’t have to waste time getting dressed in the morning. You can simply put them on and go! These Adidas sneakers are incredibly high-quality, comfortable and super stylish. Luvable Friends are a brilliant children clothing brand that delivers high-quality gear at great prices. These fleece booties are adorable and practical baby shoes that will keep little feet warm and secure. They are designed to wrap around your baby’s feet and fasten with a Velcro closure, to keep them secure to their feet while still allowing movement. As they rely on Velcro, they are also incredibly easy to put on so you don’t have to waste time and can simply just go out on your next adventure. 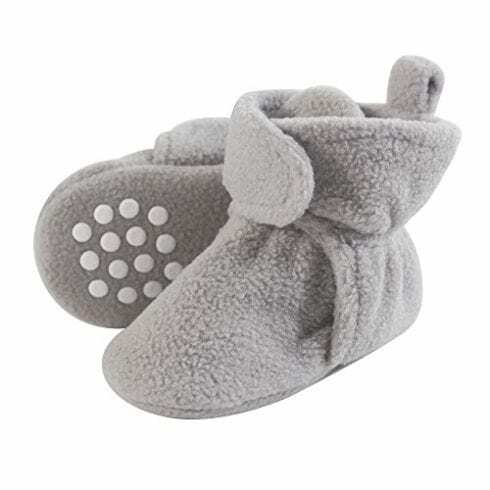 These Baby Cozy Fleece Booties feature a non-skid sole which is design to keep babies upright and safe on all surfaces. As the sole has grips, these boots can actually contribute to their developing crawling and walking skills, as it gives them something to cling on to for balance. There is a great range of muted and neutral shades available, as well as the classic pinks and blues, to ensure that all babies can have their own pair of fleece booties. These fleece booties are super cute, fashionable and practical for growing babies. Protecting your baby doesn’t just stay on land. These Baby Swim Water shoes are designed to keep baby’s safe and upright even when by the lake, sea or on the beach. These shoes are incredibly flexible, making them comfortable to wear and supportive of growing feet. They have a thin rubber sole that protects delicate skin from the hot floor and provides a grip. The high-quality material is designed to fit little feet comfortably like socks, ensuring that they can’t come off easily or be swept away when playing in the sea or lakes. These Water Shoes are unisex and are available in a great range of colors and fun designs to suit any little one. Your kids will be so excited by the bright colors and character designs that they’ll love wearing these. These slip-on shoes are flexible and lightweight, to support all kinds of movement including running, jumping and walking on various surfaces or lands. These water shoes are super comfortable, lightweight and a cute way to keep little feet safe and protected even in new lands. Converse is a renowned shoe brand, and now even your baby can get involved with their timeless style and fashion trends. These infant sneakers take up the classic silhouette and make them incredibly easy to wear for little feet. The double hook and loop closure is super easy to put on and take off, making these sneakers suitable for busy families. The shape is incredibly cool and comfortable low-cut, which ensures that growing feet are secure. 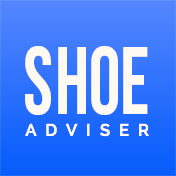 The rubber sole is designed to be comfortable and allows the feet to move within the shoe. It also keeps feet safe when learning to crawl or walk on the ground. 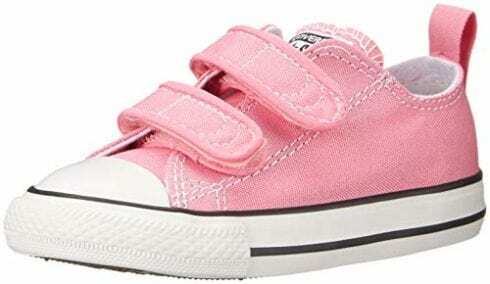 As with all Converse sneakers, the infant versions are available in a great range of colors to suit any baby or style. The textile upper is breathable and lightweight, allowing movement even when worn. They are designed to be as comfortable as possible for baby’s feet. Converse sneakers are some of the most iconic footwear available, and now your baby can join in the trend with these infant versions. 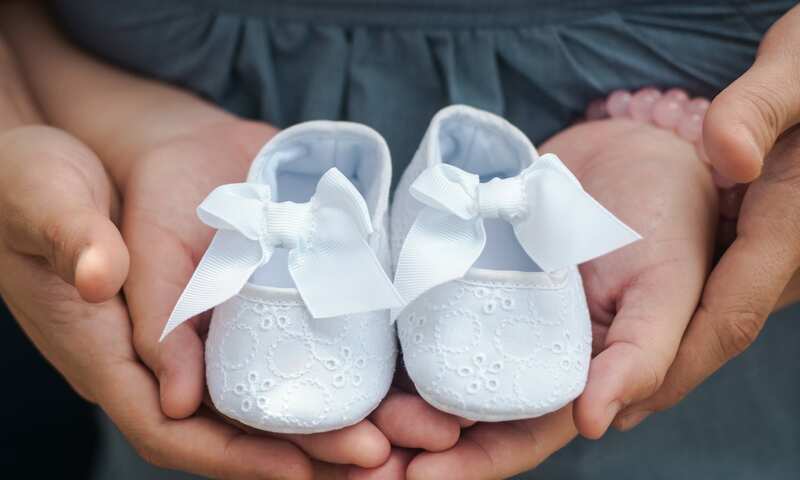 These sneakers have a timeless and legendary design that will never go out of fashion so you can keep these sneakers as an adorable keepsake even when your child grows out of them. They have a modernized rubber outsole that is designed to support and enable grip. This makes these sneakers incredibly safe and secure, even for wandering babies. The classic nylon upper and leather PUMA stripes make these sneakers incredibly fashionable and can match any outfit you choose. They are available in a great range of colors, making these sneakers unisex and suitable for every child. The interior is incredibly comfortable and is manufactured to keep little feet secure and structured. This is essential for babies who are growing more and more every day, as you want to ensure they are developing in the right way. 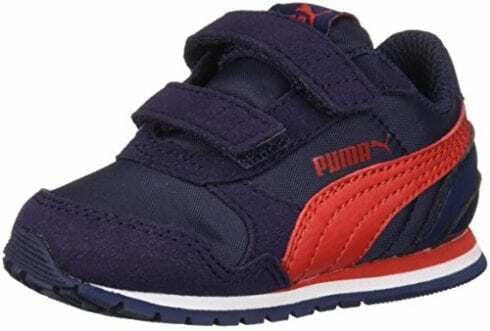 These PUMA St Runner sneakers are fashionable, comfortable and supportive for developing baby’s feet. PUMA is a leading sportswear brand, and their infant sneakers maintain their high-quality and comfort. These high-quality Fleece Lined Booties are incredibly comfortable and keep feet warm even on the coldest days. They are available in a great range of bold, bright colors so you can get a pair to suit every outfit! The great variety of colors ensures that they are unisex and can be worn by both baby boys and girls. The booties are made from fleece with a soft cotton lining and sole. 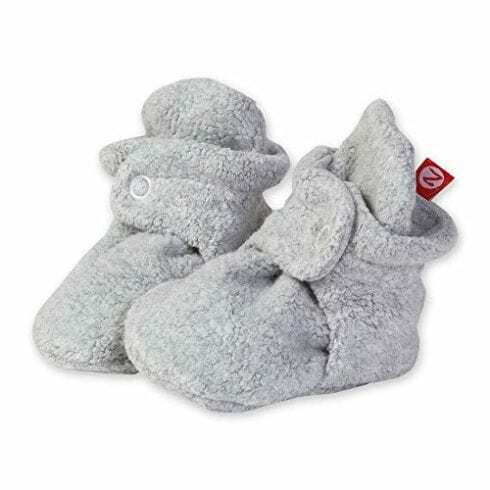 This ensures that they work to keep little feet warm and cozy in all conditions, as well as being incredibly comfortable. They can easily be worn all day without irritating feet. They are lightweight and flexible which allows your baby to move their feet, without losing the shoe. It features two snap hook and loop closures that keep the boots secure to the feet while being easy to put on or take off. As well as being incredibly comfortable, these booties have a flexible sole with anti-skid grips. This helps keep your little one upright and secure, even when they’re learning to walk or crawl. These adorable booties are very stylish, comfortable and are designed to keep little feet warm. These adorable and highly fashionable high top sneakers have been through multiple safety tests to ensure that they are the highest quality possible. They are designed to protect your baby’s delicate feet and support their growing development. The sneakers are made from super-soft and lightweight cotton, which is comfortable for your baby to wear. The sole is also made from cotton but features a non-slip grip. 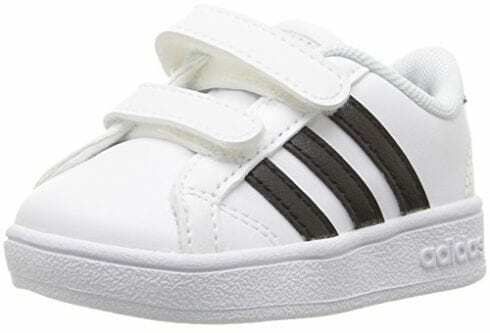 This makes these sneakers ideal for babies who are learning to crawl and even walk. They will be secure and stable on all surfaces in the home. The fashionable Star High Top Design of these sneakers ensures that they can be worn during every season and match any outfit. This versatility is furthered by the wide range of colors or designs that are available. These sneakers are easy to put on and take off small, wriggling feet with their lace-up design. They are suitable to be worn indoors and at various outdoor landscapes, such as the playground or park. Keeping your baby fashionable and safe doesn't have to come at a considerable cost. These versatile sneakers are super cute and comfortable. These cozy fleece booties are designed to keep your little ones’ feet warm during the winter months. They are super soft so there is no need to wear socks with them. They are lined internally and offer enough room for your baby to stretch and move their feet, without coming loose or losing the shoe. These booties feature a hook and loop closure that is easy to handle and keeps little feet secure, but comfortable within the shoe. This closure is adjustable – simply pull the tag to tighten the shoe. This means they are long lasting and suitable for your baby. They can also grow with your baby and keep their feet warm for longer. 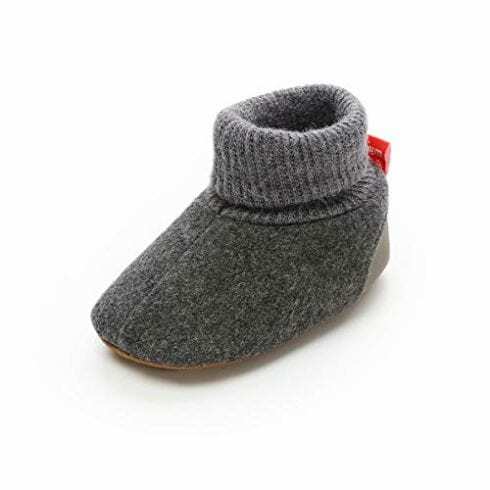 These booties are made entirely from fleece, but they do feature non-slip grips on the sole. This helps keep your baby balanced and steady even when they begin to toddle around the home. There is an excellent range of colors and patterns available in this shoe, including animal designs that your kids will love. These booties are great quality and adorable in their designs, which ensures that parents and babies alike will love them. The more comfortable the shoes are, the better they will be for your baby. Look out for lightweight materials such as cotton or fleece when shopping for baby shoes. These will be the most comfortable for your baby and will allow for room to grow and move. Babies grow so fast, and it is super important that you purchase shoes that can keep up with that. You should be able to bend baby shoes in your hand. Flexible materials allow your baby to find their feet when wearing shoes as well as aiding proper growth and development. Although babies cannot walk properly yet, you still need to give them shoes that have some form of grip. 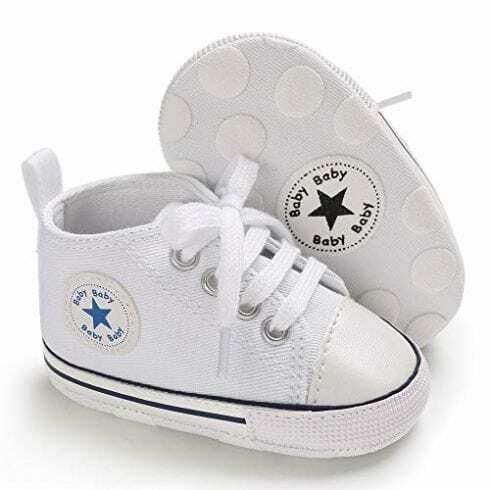 Sneakers or booties that have rubber soles, grips or non-slip additions are great for your baby. This will help keep them upright and stable on all surfaces and encourage them to develop walking skills. Due to how fast babies grow, a lot of parents seek out different ways to kit out their kids with comfortable shoes without spending too much money. You can actually make your own baby shoes from fabrics that you have at home or ones you can purchase from a craft shop. You could even recycle old fleeces and make some cute booties for your baby. As babies cannot walk, it is not as important for them to have solid soles on their shoes yet. This gives you plenty of room to be creative and DIY some baby shoes. The first shoes you purchase for your baby are designed to keep their little toes warm and growing feet safe. You want to make sure that the shoes you are buying allow movement, to help your baby develop properly. You can get your baby’s feet measured in most shoe stores, or you can do it at home. When trying on shoes, you want to check that your baby has enough room. You can check this by inserting your thumb into the shoe with their foot. If your baby has enough room, there should roughly be around half an inch (a thumb width) between their toes and the end of the shoe. It is recommended that if your little one is just learning how to walk or crawl around the home that you let them be shoeless for the time being. This gives them a chance to develop balance and coordination naturally. Hard soled shoes should not be worn until your child has developed the ability to walk heel to toe, which can take time as most babies walk flat-footed at first. Soft soled shoes can be worn as early as necessary to protect your babies feet from the cold or hard floors. These should be flexible and lightweight. Baby shoes should be flexible, so try bending them in your hand before buying. Babies do not need shoes the minute they start walking. Allow your baby to explore the insides of your house barefoot to develop balance and coordination. We hope you enjoyed our article on "10 Best Baby Shoes in 2019", if so, please share and rate it.